How Has the Mexico-US Border Changed in History? Figure 1. The Treaty of Guadalupe Hidalgo had lasting effects and largely created most of the regions that would form the United States and Mexico border regions. The Mexico-US border today is a contentious topic, recently leading to a government shutdown due to disagreements between the president and Congress in funding of a wall that would separate the two countries. One contention has been that crime coming from Mexico has affected the United State's safety, necessitating a wall, although little data supports any spike in crime, particularly when compared to average US crime, due to migrants crossing from Mexico. The border itself has changed as the two countries evolved. The border reflects the history between the two countries, that has sometimes been hostile while other times reflecting strong relations. After the successful War of Independence against the United Kingdom, the United States established its border with New Spain and what would become the region of the Louisiana Purchase, a territory stretching mostly west of the Mississippi River. The Treaty of Fontainebleau in 1762 ceded what would become the Louisiana Purchase to Spain from France. However, in 1800 France regained the territory from Spain. Napoleon, although wanting to keep the territory to create an empire in North America, could not afford to hold the territory while fighting the United Kingdom and other states. His need for money prompted the French to sell the territory to the United States in 1802. This effectively created the border with New Spain, what was then Mexico under Spanish rule, along what are now Texas, Oklahoma, Colorado, Wyoming, and Montana. This border stayed relatively stable for the next few decades. From 1810-1821, Mexico fought its own war of independence with Spain. Mexico succeeded in 1821 in establishing itself as an independent country that controlled what is mostly the Western United States and modern Mexico. The first few decades of Mexico's history were turbulent, as a struggle for power between conservatives, who wanted a centralized form of government, and liberals, who wanted a more federal system with more freedom for the states of Mexico, developed. One early goal for Mexico was to stabilize its frontier regions, particularly in what is now Texas, which was officially called Coahuila y Tejas in Spanish. Mexico invited settlers to come to the region that was underpopulated, allowing settlers from the United States to arrive. Very soon, these settlers outnumbered Mexicans, called Tejanos, and native populations living in Texas. Armed hostility between the new, mostly Protestant settlers had increased over the years, with more Mexican troops now being stations in Texas. Some of the problems included the Mexicans claiming the mostly white settlers refused to pay taxes, while the settlers had claimed the government to be corrupt. The first battle of what would become Texas' rebellion from Mexico took place at the Battle of Gonzales, although this was a relatively minor skirmish. In 1834-35, Santa Anna seized power in Mexico, who wanted to centralize control, where he suspended the Constitution of 1824. This caused a revolt in several provinces in Mexico, including now throughout Texas. Emboldened by Santa Anna's actions, a Texas independence movement led to the declaration of the Republic of Texas, an independent country, to be created in 1836. The Mexican army invaded Texas and after defeating and massacring rebels at the Alamo and other battles, Santa Anna himself was defeated at the Battle of San Jacinto, which led to his capture and being forced to sign a treaty that ended hostilities and ultimately gave Texas independence. The conflict between Mexico and the independent state of Mexico continued between 1836-1845. Part of the dispute was about the boundaries of the state, with Texans wanting areas covering what is now Western Texas and parts of surrounding states. In 1845, Texas was finally allowed to become the 28th state of the United States after a contentious process of debate in the US Congress. Newly elected James K. Polk had developed an expansionist vision for the United States, where the Manifest Destiny was widely supported in Congress, particularly the Democrats. California now also became the key prize, as that became seen as a wealthy place that would also give the United States great power by expanding to the Pacific Ocean. The United States also wanted to prevent Britain from gaining this territory. Soon, a border dispute arose between Mexico and the United States, mainly with the United States wanting the Rio Grande to be the border between the two countries. The United States sent a delegation to Mexico to negotiate the purchase of territory to California, but they were refused. President Mariano Paredes y Arrillaga then seized power in Mexico, where he did not recognize Texas' independence from Mexico. Polk ordered General Zachary Taylor (himself a future president) to move into the disputed territory with Mexico along the Rio Grande, sparking the Mexican-American War. After some defeats by the Mexicans, Santa Anna returned to power but this did little to change the fortunes of the war for Mexico. By 1848, Mexico had lost many of its key cities to the United States, although it fought some successful actions against the United States, forcing it to sign the Treaty of Guadalupe Hidalgo. This effectively created many of the western states of the United States and the border with Mexico to be defined near its present boundaries. The 1854 Gadsden Purchase, which was the purchase of land in southern Arizona and New Mexico, created what is effectively the current boundaries between Mexico and the United States. The creation of the new states and the war itself were extremely controversial in the United States, only surpassed by the larger slavery issue, where many had felt the United States acted belligerently by starting the war and forcing Mexico to cede land. The years after the war were still difficult for Mexico, as disease and Native American raids became a large problem in northern Mexico. 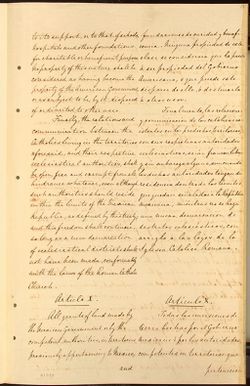 One of the provisions of the treaty required the United States to effectively deal with Commanche raids that became problematic for the United States and Mexico. This issue was not resolved for many decades and wars between Mexico, the Commanche, and the United States continued through the 1870s. What began to change, however, is northern Mexico began to orient economically more with the United States, as the region was somewhat disconnected with the power centers of Mexico to the south. Towns along the border soon began to boom economically. The Mexican Revolution in 1910 soon changed what was a growing relationship between Mexico and the United States. Increasingly, citizens from the United States owned land and resources in Mexico, which likely helped lead to the revolt and revolution in Mexico, where different classes often sided in different factions within the armed conflict. This created increasing problems between the two countries, leading the United States to enforce new acts that required a literacy test and head tax to be conducted on Mexicans entering the United States as the conflict in Mexico intensified. This was suspended during World War I due to labor shortages but was reimposed after. Instability in Mexico, particularly along the border, led to Francisco "Pancho" Villa to conduct a raid into the United States called the Battle of Columbus. Villa was chased by United States forces but never captured. Under intense pressure from Mexico and only the looming events of World War I led to the withdrawal of American forces. The Zimmerman Telegram, sent by Germany in World War I to bait Mexico into entering a war with the United States, also led to great suspicion. After the war, the Federal Bureau of Investigation was dispatched to the United State-Mexico border and fences were soon erected along the border. Meanwhile, the situation in the border became worse, as crime and cross-border smuggling increased, particularly during the revolution in Mexico that lasted from 1910-1920. Hostilities may have also been exacerbated by the hostilities after the Zimmerman Telegram. Increasingly, fences went up and checkpoints, which also became official points of entry after the 1920s, were established. In the period after World War II, economic factors increasingly affected the border situation between the United States and Mexico. Although relations between the countries have considerably improved since then, what has changed is economic growth in the United States far outstripped economic growth in Mexico. This has led to increased migration from Mexico to the United States, where most migrants seek higher wages offered in the United States. Persistent economic change in Mexico has led to wide inequalities in society. Poverty is particularly acute in the Mexican countryside, leading to increased migration to the border regions. Throughout the second half of the twentieth century, migrants also came for seasonal work and others through legal migration. However, illegal migration would fluctuate, often in correlation with events in Mexico, such as ongoing violence in some regions or economic problems. What is today the southwestern United States once belonged to Mexico and the war that gave that land to the United States has been seen by many historians as having been sparked so that the territory could be taken from Mexico? While the early 20th century saw a lot of turbulence at the border, most of the late 20th century and early 21st century problems have economic causes, although at times violence in Mexico and other Latin American countries has sparked some waves of migration to the border regions. ↑ For more on the Louisiana Purchase, see: Rodriguez, J. P. (Ed.). (2002). The Louisiana Purchase: a historical and geographical encyclopedia. Santa Barbara, Calif: ABC-CLIO. ↑ For more on the history of Texas and Mexico during the early 19th century, see: Davis, G. (2002). Land! Irish Pioneers in Mexican and Revolutionary Texas (1st ed). College Station: Texas A&M University Press. ↑ For more on the Mexican-American War, see: Nardo, D. (1999). The Mexican-American War. San Diego, CA: Lucent Books. ↑ For more about the post-war years along the border in the 19th century, see: St. John, R. C. (2011). Line in the sand: a history of the Western U.S.-Mexico border. Princeton, NJ: Princeton Univ. Press. ↑ For more on the instability in the early 20th century along the border, see: De León, A., & University of Houston (Eds.). (2011). War along the border: the Mexican Revolution and Tejano communities (1st ed). College Station: Texas A&M University Press. ↑ For more on recent history along the border, see: Ganster, P., & Lorey, D. E. (2016). The U.S.-Mexican border today: conflict and cooperation in historical perspective (Third edition). Lanham: Rowman & Littlefield. This page was last edited on 2 February 2019, at 11:03.